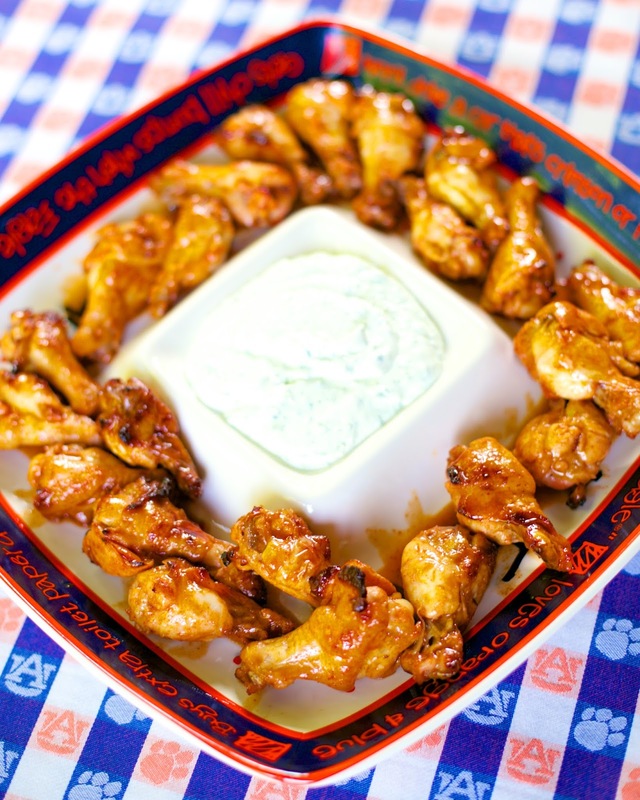 Add these wings to your tailgating menu ASAP! The are crazy good! They taste just like a margarita. You can really taste the lime in these wings. There is lime in brine, sauce and dipping sauce. I baked my wings because I don't like to fry stuff at home. Feel free to fry the wings if you prefer that method. The recipe looks like a lot of work, but it really isn't. There isn't much hands on time at all. The hands on time is less than 20 minutes. The brine takes about 5 minutes to whip up. Once the brine is done, let the wings hang out in it overnight. Bake or fry the wings when you are ready to eat. While the wings are baking, whip up the hot sauce and dipping sauce. You can skip the dipping sauce, but it is really good!!!!! 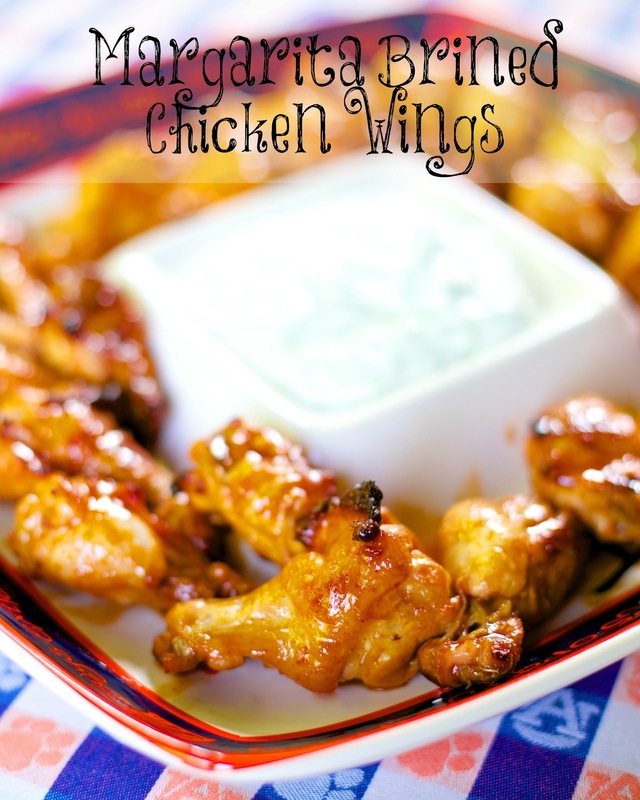 This is our new "go-to" recipe for wings! For the Brine - In a large saucepan, heat water, salt, liquor, lime until salt dissolves. Add 6 cups ice. Place wings in ziplock bag. Pour brine over wings. Refrigerate 3 hours or overnight. To Cook the Wings: Preheat oven to 400 degrees. Line a rimmed pan with foil. Place baking rack on top of foil. Put wings on rack. Bake 45- 50 minutes, turning half way. For the Sauce - Melt butter, and whisk in hot sauce, agave nectar and lime juice. Toss wings in sauce when they come out of the oven. For the Dipping sauce - In a food processor, pulse together jalapeño, garlic, cilantro, lime juice. Add sour cream and Ranch mix, pulse until combined. Serve sauce with margarita wings. The "1/2 lime juice", is that also 1/2 cup? Thanks in advance. Love your recipes! Yes - I fixed it. Thanks! Any recipe containing the word margarita immediately grabs my attention and I'm glad this one did. Each part of it sounds delicious and I can imagine them all together. I'm guessing they would also be good cooked on the grill. Larry - these would be AMAZING on the grill! Great idea! What brand of hot sauce do you use? Made these for supper tonight using drumsticks (on sale 95¢/lb) and grilled them instead of baking. I brushed them with the sauce as they were grilling, just building a glaze on them. Took a portion of the dipping sauce, added some light mayo, red wine vinegar, and some sugar and stirred it into shredded cabbage, green onion, diced jalapeno, diced red bell pepper and cilantro. Also made up a black bean/rice dish as another side. The wholesale was amazing! Thanks so much for this recipe! Will make again and again! These are a new favorite of my husbands!! They are very good!